If you're recently bereaved, you need a high quality cremation urn that has been made with love, so you can honor the memory of the dearly deceased. - Express Your Love and Affection with this beautiful Forever Remembered Classic Blue Small Keepsake Urn which are handcrafted to give your loved one's remains the superior quality they deserve. - Everytime you, your friends and family see their urn, you will see a fitting tribute to the one you love and they lived and you shared together. - We're confident you'll cherish this urn for human ashes, but if for any reason you're not 100% satisfied, we offer a 90-day money back guarantee. No questions asked. BEAUTIFUL URN FOR YOUR CHERISHED LOVED ONES - Forever Remembered Classic Blue Small Cremation Keepsake Urn For Human Ashes were created to be a beautiful tribute to your late loved ones. This is a very comforting and thoughtful way to celebrate and remember the wonderful life your loved ones had lived. You will feel very peaceful as your loved ones remains rest in this beautiful urn. A BEAUTIFUL WAY OF REMEMBERING YOUR LOVED ONE - This Single Blue Small Cremation Keepsake Urn features a very beautiful design. It is a respectful and wonderful tribute to your late loved ones. It is also a very memorable gift to those family members who would also want to carry and beautiful lasting memory of your loved one. 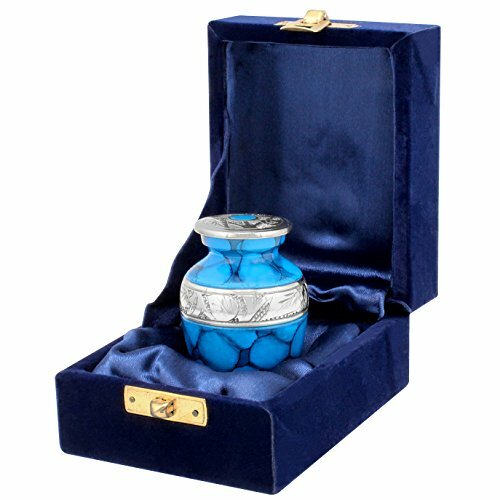 THIS DURABLE AND HIGH QUALITY URN IS MADE TO LAST THE TEST OF TIME - These Blue Keepsake Urns is made from the highest quality of material with superior craftsmanship and strict quality control. Each urn features a secure screw on lid and was built to last to make sure that your loved ones are given with nothing but utmost respect. INCLUDES LOVELY SATIN FABRIC LINED VELVET CASE - This beautiful and comforting velvet case is perfect for carrying, storing and safegaurding your urn. Lastly out of respect we don't put our logo on the bag or case, its a sacred urn, not a place for an advertisement. THIS URN WILL LEAVE YOU COMPLETELY SATISFIED OR FULL REFUND - Trupoint Memorials is a company who cares for you, your family, and your late loved one. If for any reason you are not completely satisfied, just return it for a full refund. If you have any questions about this product by Trupoint Memorials, contact us by completing and submitting the form below. If you are looking for a specif part number, please include it with your message.